Decorations are one thing but the Christmas heart of every retail centre simply doesn’t beat… without Santa. And boy, do we super-charge our seasonal Santa displays! A Visual Inspirations Santa Claus installation is unlike any other you would have seen. Our seasonal display team knows how to create the ultimate atmosphere of Santa’s Christmas cave. By the time we’ve finished, your customers will be soaking up the one-of-a-kind atmosphere that will reap rewards. After all, statistics show that shopper’s emotions are raised to a happier level when decorations abound throughout the centre, resulting in a better spend rate. A well-structured retail Christmas display with Santa at its helm is the perfect invitation for families to visit again and again throughout the festive season. While a Santa front and centre at your Christmas event or function always makes for a highly memorable impact. Big kids love sitting on Santa’s lap too and once Visual Inspirations has had their way creating your ultimate Christmas experience, photos with your company banner displayed in the background, will be hitting social media minute by minute! Your centre is different to any other centre. Where you wish to place Santa, entirely depends on where you want to create the most through-traffic and attention. We specialise in slipping Santa into the most beneficial spot on site, custom designing everything based on centre requirements. 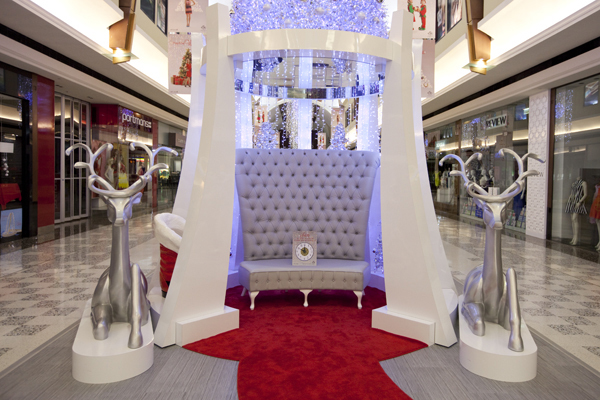 So, if it’s a small space, a simple throne can be supplied but still dressed up for maximum high quality impact. The larger the space, the more we can add to the Christmas story: the red carpet, a lush tree, reindeer props and a forest of baubles. We don’t think customers see this enough – your very own Santa in an individual store. It absolutely brightens up your merchandise and allows kids to be kids while mums and dads get on with the shopping. Small clients of Visual Inspirations have opted in the past for hiring individual Christmas props that make their displays eye-catching and heart-warming. We’re ready to assess your space for the best Santa solution. So, you know you need to wow your customers with Santa but you’re not sure what we provide? Well, let’s simply say – anything and everything. We achieve the gloriously impossible with packages that culminate in a high quality retail Christmas display. From small spaces to the grandest of entrances, Visual Inspirations deck the halls like no other Christmas display company in Australia. Not sure how stunning we can be? Then it’s time for a taste test, of sorts. Call or email us today and let us entertain you with a myriad of past success stories.